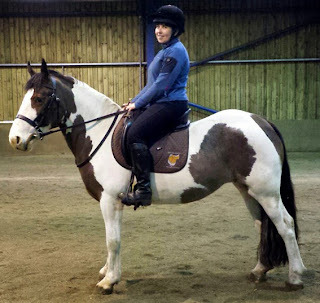 Solution Saddles Customer Stories: Ann Nisbet & her daughter love their SMART Native GP saddle - and the difference in their 5 year old Irish Cob is remarkable. Ann Nisbet & her daughter love their SMART Native GP saddle - and the difference in their 5 year old Irish Cob is remarkable. 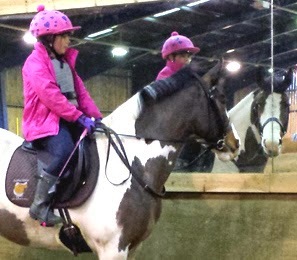 Mildred is a 14.3 hh, 5 year old, Irish cob I share with my daughter, Lara, who is 10; she is the realisation of my lifelong dream to have my own horse after years of riding other peoples'. She is as bombproof as they come but definitely not a plod. After buying Mildred, it rapidly became clear that saddles were going to be a problem due to her very round well sprung ribs and her long reaching shoulder action. Every saddle we tried felt "perched on top". Canter was uncomfortable as I was constantly being pitched out of the saddle as it was moving against her action - an awful twisting sensation. Mildred started to develop rubs quickly and seemed to be awkward and uncomfortable in her breathing when working. I didn't feel safe jumping at all, but was more concerned about the damage it could be doing to her. I had read articles about treeless saddles being the ideal solution for the rounder native build. 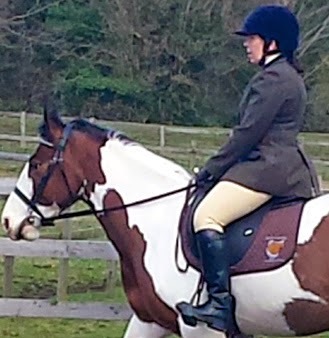 A friend then lent me a treeless saddle that she has for her Thoroughbred for me to try; I was so impressed that I contacted Solution Saddles immediately. I arranged to try a SMART Native GP saddle with a Solution Saddles Technical Advisor who came out and fitted the saddle for both myself and Lara and we all just love it. I now feel safe and comfortable, as does Lara, but most of all the difference in Mildred is remarkable. Her movement is even more fluid and lots of people have commented on the change in her; one of the BHS AI instructors on the yard said the "change is really amazing -and I thought her movement was stunning before the new saddle!". Her breathing is now perfectly normal even after a tough lesson and I can really feel what she's doing in her quarters so much more. Jumping is fun again and all the rubs have gone. I cannot recommend Solution Saddles enough, our Technical Advisor was so approachable thorough and helpful both during and after the initial fitting. The saddles are beautiful, comfortable and really high quality. Mildred, Lara and myself are delighted.